Easy Homemade Chorizo Sausage. Lower salt & no added preservatives! Easy Homemade Chorizo Sausage. Lower Salt & No Preservatives! Some freshly ground pork and some common ingredients and readily available spices is all you’ll need to make this incredibly flavourful homemade spicy chorizo sausage. 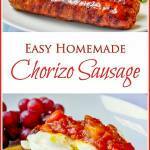 Easy Homemade Chorizo Sausage – Lower Salt & No Preservatives! Easy Homemade Chorizo Sausage – You know, St. John’s, Newfoundland is not the best place in the world to find a wide variety of ingredients for my cooking experiments but still, I persevere. Don’t get me wrong, things have gotten much better over the last 20 years or so with much more available than at one time. This recipe however, still does not rely on fresh or even canned or bottled chipotle or other hot peppers that you may not be able to find locally, instead it relies on the contents of your spice rack to bring great seasoning to the meat in this tasty pork sausage. While you can get the dry chorizo form of this sausage in at least one local supermarket, I have never had the fresh version in this neck of the woods. Chorizo sausage is one of my favourites, especially as a slightly spicy little kick-start to your day at breakfast. They are great smoked or grilled and tossed with peppers and a quick tomato sauce then served on pasta. Another favourite recipe idea that we will be featuring soon, is to add some of this chorizo to burgers which we then like to top with guacamole. That’s one of the tastiest things you will have off the grill this summer. This recipe makes about 4 pounds of sausage, part of which we will portion into freezer packages to enjoy later. I do use my sausage stuffer attachment to my Kitchen Aid Mixer to make some link sausages but I also freeze some of the loose sausage meat, formed into patties to enjoy for breakfast or to add to those burgers we mentioned earlier. Check your local butcher supply shop for sausage casings or get them online. Homemade Chorizo Sausage on open face breakfast sandwich with Spicy Tomato Compote. As a totally delicious weekend brunch idea, especially if you are entertaining is to try some of our homemade chorizo sausage with an over easy egg and spicy fresh tomato compote on fried ciabatta bread. Find the recipe for our Spicy Tomato Compote by clicking here. This Homemade Chorizo Sausage has become one of our family’s favourite additions to homemade pizza night; a household specialty. The sausage alone, a great sauce and your favourite cheeses are all that’s needed to make what is bound to become of of your favourite pizzas too. We sometimes like to use the Spicy Tomato Compote used in the brunch dish above for the pizza sauce and you can find out how we make our pizza dough in this recipe. 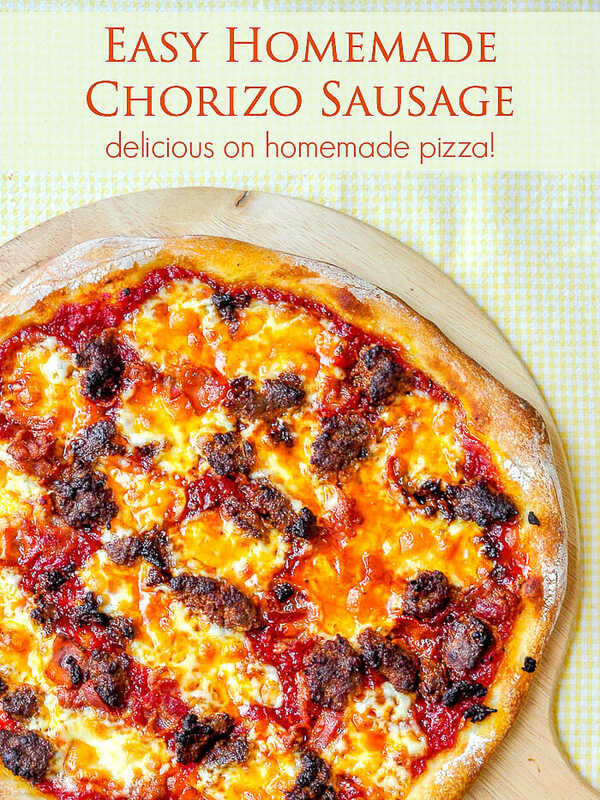 Like this Homemade Chorizo Sausage Sausage recipe? Originally published July 4, 2013. Updated with new photos Feb. 2018. Mix together the cumin, chili powder, cayenne pepper, granulated onion, smoked paprika, oregano, chipotle powder, brown sugar, salt, pepper and minced garlic. Divide the ground pork into roughly four portions, adding each portion to a large bowl one at a time and creating layers by sprinkling 1/4 of the spice mix over each layer of meat. This helps to evenly distribute the seasoning through the sausage without over mixing it. Mix together the red wine vinegar and water. Pour over the layered pork and seasoning and mix well. Stuff into prepared sausage casings or portion into one pound packages and freeze for later use. Looks delicious, but I don’t use pork! Which do you think would work better ground beef, chicken or turkey? Usually I use veal as a sub for pork but can’t get it now. I’d try chicken or turkey. Hi , from south of Ottawa ! I had the pleasure to visit last October I rented a house in conception bay . My grandson goes to memorial u . I have been trying different sausage recipes the past few months and yours is a keeper ! My family love them … thank you for the awesome recipe. I enjoyed reading your lil story . In your recipe for spicy tomato compote, it calls for crushed chili sauce. Is that like the crushed chili flakes or is it a spice or a sauce? Sometimes sold as crushed chilli paste. Chilli flakes are an easy substitute. I don’t think exttra salt is necessary. I am smoking brisket this weekend LOVE anything smoked!